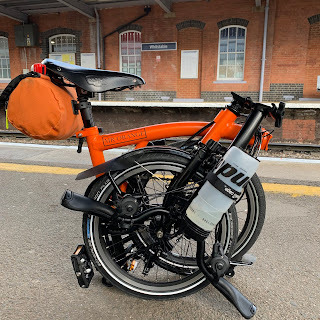 My Orange Brompton: Brompton Toolkit Number Two! Many Brompton owners will already know that I bought one of the first Brompton Toolkits upon its release. I have also written that I did not dare use the tyre levers as there were some horror stories of them snapping. You may also recall from an earlier post that my friend Mick managed to get me the new version of the Brompton tyre levers and I replaced the orginainls for these. Imagine my surprise when I opened a Christmas present from my parents to discover they had bought me one of the new Brompton Toolkits! My patents are both in their 80's and while still fairly active for their years they rarely stray out of their familiar haunts. Enquiring how and where they got one they told me that they started off at at a shop in South Kensington but a helpful shop assistant (and perhaps Brompton owner themselves) told them that their best bet was to try Brompton Junction. At the end of the Brompton themed ride where we ended up at Brompton Junction I bought one of the last few toolkits on display for someone at work who had given me the money to do so. I find it astonishing that my parents ended up there as they rarely stray too far from SW7 / NW8! The Brompton Toolkit is a thing of beauty but I have to report that I have used the tyre levers to successfully remove a pair of Marathon Plus tyres with little drama. The new levers are excellent and at last I feel confident to use them. The Toolkit is expensive and if you look at my previous posts on this subject (I have posted a link to it below) you might understand why. I have two Brompton bicycles and now I have two toolkits. I cannot say I was disappointed and I was rather touched that my parents put so much effort into buying something they knew I would love! I put two spare tubes in the other frame tube and was looking for ideas that you well experienced owners have.